KATHMANDU, April 9: Police fired three rounds of teargas shells and baton-charged the cadres and leaders of Rastriya Prajatantra Party (RPP) for obstructing vehicular movement on the Exhibition Road, Monday. The RPP held a rally to protest against the government for not fulfilling their demand of a Hindu nation. The protest rally led by RPP Chairman Kamal Thapa and former minister Deepak Bohara marched from Ratna Park via Exhibition road to Padmodaya junction where the rally converged into a peaceful sit-in at around 2:30 pm. The peaceful protest attended by hundreds of RPP leaders and cadres ended up obstructing the vehicular movement along the road which led to the clash with police. Police claimed that the leaders and cadres of the party threw stones at them prompting them to take action. 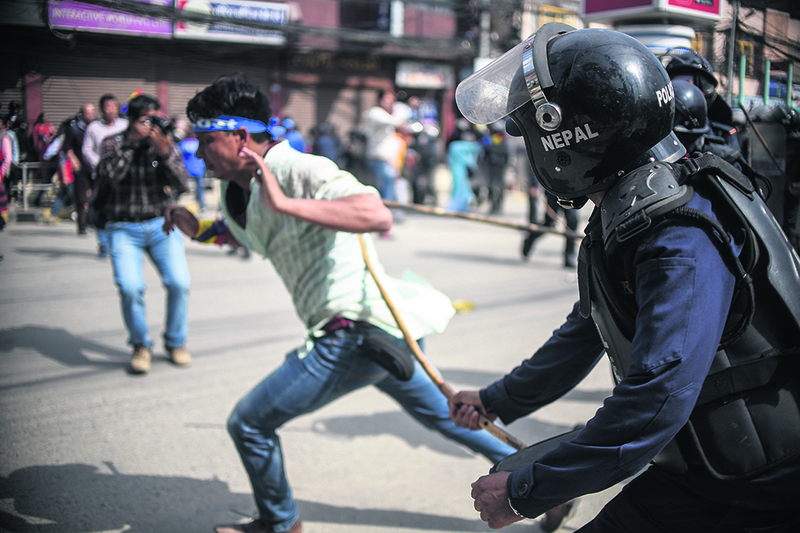 “The leaders and cadres of the party threw stones at our personnel after which they baton-charged the leaders and cadres,” said DSP Hobindra Bogati, spokesperson at the Metropolitan Police Range, Teku. He added that three rounds of teargas shells were also fired to disperse the crowd. Police said they did not baton charge the top-notch leaders of the party including Thapa and Bohara. Police have also arrested 20 leaders and cadres of the party including the president of the Kaski chapter of RPP Mahendra Bahadur Karki from Pokhara for disrupting vehicular movement. According to the spokesperson of the District Police Office, Kaski, DSP Rabindra Man Gurung, all of the detainees were set free after brief detention. “The leaders and cadres were detained for entering the restricted area in front of the Chief Minister's Office,” DSP Gurung said. The RPP said in a statement that the government breached their right to peaceful protest by disrupting the sit-in with the help of police force. RPP has said that the government's autocratic nature has been revealed by the intervention in the peaceful protest. The statement has condemned the high handedness of the government on crushing the peaceful protest as a violation of the people's fundamental right to participate in politics and their right to freedom of expression. As part of its nation-wide protests, the Kamal Thapa-led RPP submitted a 22-point memorandum to Prime Minister KP Sharma Oli on February 19. In its memorandum, the party had sought to scrap the provision of secularism enshrined in the constitution, reinstatement of Hindu state, a referendum on federalism, stringent action against secessionist forces and safeguarding the territorial integrity. Other demands of the party were crackdown on corruption, action against those involved in corruption and control of price hike. The party had also urged the government to take initiative to bring back Nepali territories encroached by India in Kalapani, Susta, and Lipulekh.